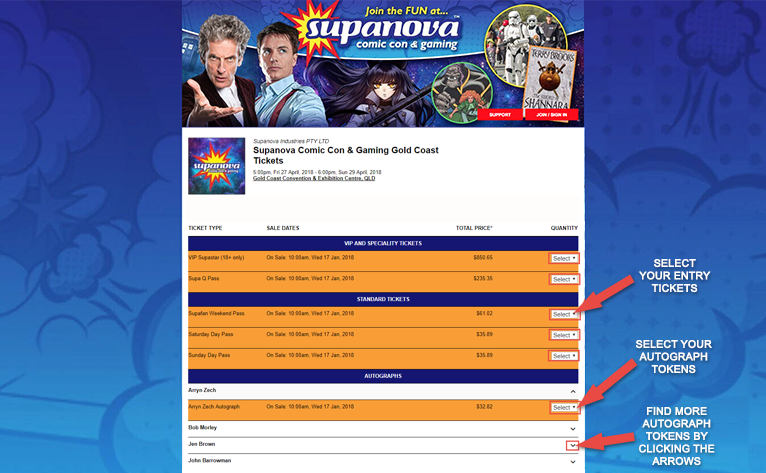 This year, Supanova tickets are returning to the main moshtix website! Make sure your moshtix account login details are up to date prior to tickets going on sale, to make sure your ticket buying experience on the day is a breeze. If you've now logged in successfully – hooray! 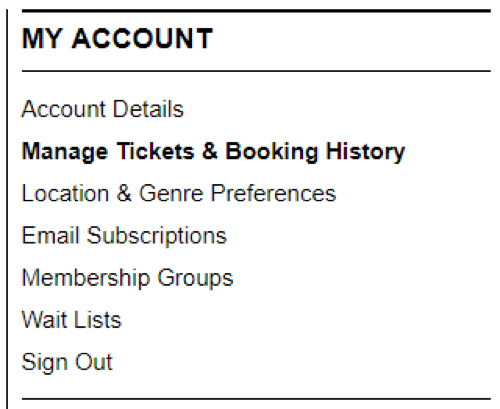 You can make sure your account details are up to date in the side menu bar, and then you'll be all set to purchase tickets. Did you get this error message? Don't worry! Just check your email for the password reset link that has been automatically sent to you (make sure to check your junk/spam folders). Once you click the link, you'll be able to update your password. Once you've reset your password, you're good to go! Go ahead and log in & give it a test. If you have any issues with updating your password, don't hesitate to give our customer service team a call at 1300 GET TIX (438 849) and they'll be more than happy to assist with the update. Now that you've got your account sorted, let's make sure you're ready to purchase some tickets! Head HERE to find Supanova tickets and select your city! Select your quantity of entry tickets (choose from a VIP ticket, Supa Q Pass, Supafan Weekend pass, or the day of your choice). Kids under 12 are able to attend for free with any paying adult! At this time, you can also select any autograph tokens you would like to purchase (you can always purchase these later on as well). Use the arrows to expand more autograph selections. Once you've selected everything you'd like to purchase, click 'Buy Tickets' to continue. Sign in! Once signed in / if you've already signed in, you'll proceed to the booking screen. 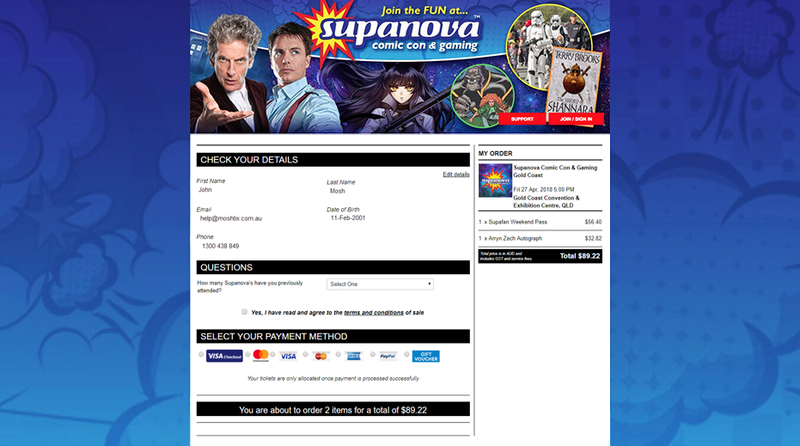 Answer the question (How many Supanova's have you attended) and agree to the terms and conditions of sale. Then select your payment method (Visa Checkout, Masterpass, Visa/Mastercard/AMEX, Paypal or Gift Voucher are all accepted), click submit, and VOILÁ, your tickets have been purchased! You can now save them as a PDF, view them – or add them to your Apple Wallet to make sure you're all set for the day! If you need to purchase any additional tickets / tokens, simply follow the same process again. I didn't receive my confirmation email / tickets. Where are they? Your tickets may have ended up in your junk/spam/promotions email folders. Have a look in there! If you still can't find them, you can always log into your moshtix account at any time to view / resend your tickets. I've followed the guide and I still can't change my password or log into my account. Help!